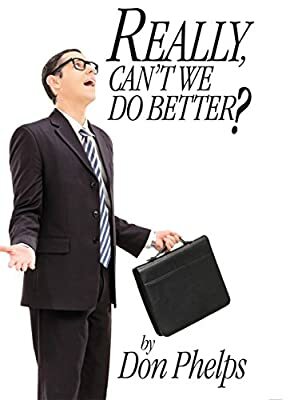 Author Bookstand is proud to offer Really, Can't We Do Better? by Bookstand Publishing. Bookstand Publishing offers books by the best indie authors throughout North America and the world. Bookstand Publishing is dedicated to offering original content to a broad audience and promoting great authors, literacy, and freedom of expression. Really, Can't We Do Better? has generated a lot of interest and excitement and we think it would be an excellent addition to your library. For the more than casual observer of the people of this wonderful country, and especially for the older group of observers, things are changing as many of our people become bored, complacent and quite frankly just don't give a damn about our country's daily, weekly and yearly lowering of our standards and morals. Many seem okay about the gradual loss of freedoms, whether they are small or catastrophic. Most people are unable to detect that the dropping of these principles are right now nudging our country, built on free enterprise, into socialism. The changing of America that is the most difficult to accept is the loss of our country's culture. The final chapter addresses this and explains why the loss of our culture is ultimately the loss of our country. This book will mostly be read and enjoyed by seasoned citizens. The author would hope that the much younger generations would read it and take it to heart. Why? They have much more to lose if we don't stop the slide and once again go on the offense making our country stronger and better.